Don’t miss this talk. Wednesday February 27 at 7 pm in the Pacific room in the UC underground on the main campus of UH. Free admission. 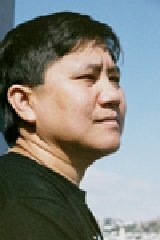 Carmencita “Chie” Abad will discuss the horrible working conditions she endured in the U.S. territory of Saipan while making clothing for the Gap. In her struggle to unionize workers, she was forced to leave the island and is now working to educate Americans about inhumane factory conditions occurring worldwide, including on U.S. soil. Chie will tell her audience what they can do to help eliminate sweatshop abuses occurring worldwide.